This is a review of the supplement COGO UR-BRAIN. This product maximizes your mental drive by elevating neurotransmission levels and brain blood flow. It also enhances memory, mental clarity, cognitive performance, mood, and focus. Read further to learn more about this product. The recommended dosage is 2 to 4 capsules once or twice every day depending on your needs. The manufacturer does not state the actual side effects. However, pregnant and nursing mothers are warned against consuming this product. Furthermore, persons under 18 years should not consume this product. You should consult a medical professional before using this product if you have any health condition. One bottle containing 60 capsules will cost you $29.00 on the manufacturer’s website. However, you can purchase this product at a price of $20.00 on Amazon. One thing to be aware of is that such a low price may also indicate low quality. The manufacturer of UR-BRAIN is confident that this product will satisfy your needs. The company has a 30-day refund policy. You can return the product within 30 days if it fails to accomplish the claimed functions. This guarantee is an indicator of quality. It increases the confidence of people who want to try the product for the first time. We did not find any customer reviews for this product. The lack of customer reviews is a significant concern for users who need to know how other users have benefited from the product. 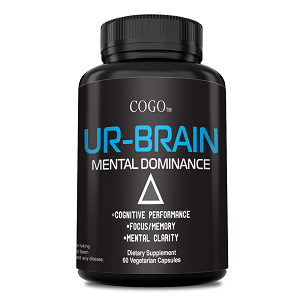 UR-BRAIN is a suitable supplement for improving mental clarity, cognitive performance, focus, and memory. This product’s ingredients are reported to have significant benefits to your body and brain. Moreover, the manufacturer has provided clear dosage instructions and a refund policy. A refund policy shows the manufacturer’s confidence in the product, which increases the confidence of users. However, potential buyers may raise quality concerns due to the lack of customer reviews. Additionally, we are not sure whether this product comes from a GMP certified facility. Henry Costa	reviewed COGO UR-BRAIN Review	on June 29th	 and gave it a rating of 3.